Since february 2011 vCenter Operations Manager (vCOPS) from VMWare is available. In comparision to other performance and capacity management tools (Veeam Monitor, vKernel vOPS,…) some important functions were missing in Version 1.0. These deficits were caught up with the latest available Version 5.0.2 and the product now offers almost everything you need. vCOPS 5 is delivered as a virtual appliance and consists of two virtual machines. It is offered in four different versions (Standard, Advanced, Enterprise and Enterprise Plus) that differ of course in price and number of features. You can also request a trial license there. Before you can import the vAPP to your virtual environment you must create an IP Pool. To do that just go to “Host and Clusters” and open the Tab “IP Pools”. For this How-to a new IP Pool named “vCOP Pool” was created. To install the vAPP, open the deployment wizzard in your vCenter (“File” – “Deploy OVF Template”). The wizzard is intuitive and self-explanatory. One of the requested information concerns the number of virtual machines. Based on this number the virtual hardware is sized. In the next steps the wizzard will query the IP configuration of the two for vCOPS required virtual machines and the previously created IP Pool. When the two VMs are up and running you can check with ping if they are reachable in the network. Should this not be the case you will have to add the gateway manually. To do that open the console of the servers and choose “configure network”. By entering “2” (default gateway) you can configure the gateway for eth0. Now open a browser to your “UI VM” Server to configure the “Inital Setup Wizzard”. 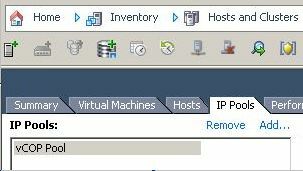 After completing the wizzard you will have to add a license for vCOPS in your virtual center. 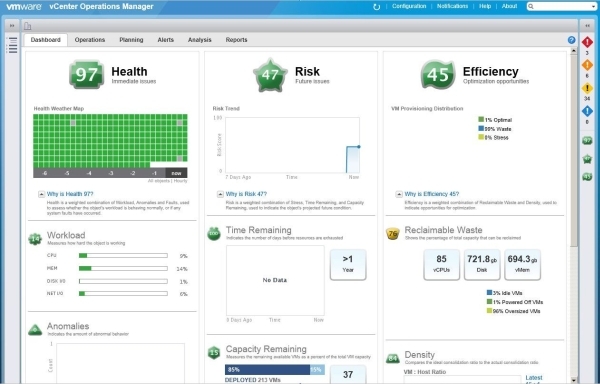 vCOPS is perfect integrated in your vCenter. One click on the application opens the vCenter Operations Manager dashboard. In the tabs Operations, Planning, Alerts, Analysis and Reports you will find all the desired date in clearly arranged drill down menues.